Readers of a certain age will recall the pure joy of cracking open a ten-pack of cassettes. With their miniaturized spools and narrow ribbons of tape, they were relatively flimsy objects. The plastic shells cracked, the screws came loose, the metallic oxides flaked off the tape itself. But for males (and females) with nerdish propensities, they had a futuristic allure. You could fit two LPs on each 90-minute cassette. If you paused the record mechanism during the needle drop, and experimented with the antediluvian Dolby switches, you got a very decent facsimile of the vinyl product. Everybody won--with the possible exception of the artist and the record company. Predictably, it was the industry that tried to stamp out the plague of cassette duplication. The British Phonographic Industry sponsored an infamous "Home Taping Is Killing Music" campaign in the mid-1980s. The BPI campaign made few inroads against copyright violation, but it did spawn innumerable parodies--including the one further below. Netscape: Finally, how will these changes impact the performers, as opposed to the music industry? Demers: Again, my sense is that artists have long ago realized that the age of the multi-platinum, multi-million-dollar-earning artist is drawing to a close. If you look at Michael Jackson, David Bowie, Madonna, etc., they were all aberrations. At no other time in world history have musicians made such incredibly large fortunes. Superstar performers like those mentioned above were able to make money because the music industry was calibrated for a very specific historical moment--a thriving middle-class population with children who had money to burn, and recording media (records, tapes) that were difficult to pirate with any fidelity. It was great while it lasted. But for every Madonna, you had hundreds of other artists who had been signed onto major labels, but lost money out of their own pockets because they didn't make enough to offset their label's original investment. Again, you can read the whole thing here. Netscape: Are you surprised by the allegations? Or did the research and writing of Double Lives destroy that capacity for surprise? Koch: I am not surprised; not even especially shocked. We in the West do not know what it means truly to lack freedom. One test of a totalitarian society comes when the exercise of the ordinary decencies, or when the mere living of something resembling a free life, calls for nothing short of heroism. When the principle of social cohesion becomes betrayal. 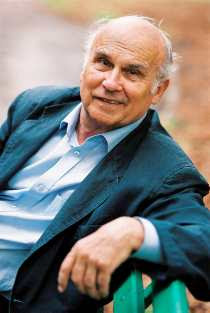 In the late Sixties and early Seventies, Kapuscinski was a Polish journalist who traveled abroad. That alone was enough for the regime to extract its paranoiac quid pro quo. The regime took something from everyone's freedom. No exceptions. None. I know, I shouldn't keep skimming the cream from No Minor Chords, it's the kind of parasitical procedure that gives bloggers a bad name. Try and stop me! Damn the torpedoes! Here's the uber-anecdote from André Previn's memoir, which so effectively encapsulates the author's love-hate relationship with Hollywood vulgarity that he named the book after it. He was the model for Scott Fitzgerald's Last Tycoon, and is generally held to have been an awesome figure of intellect, taste, and drive, and the old-timers in Hollywood still speak of him as a sort of combination Ziegfield and Teilhard de Chardin. It is entirely possible that he was a beacon of enlightenment but when it came to music his fund of information was minuscule. One day, the story goes, he was in his projection room running a new MGM film when something on the sound track bothered him. "What is that?" he asked irritably into the darkness. "What is that in the music? It's awful, I hate it!" The edge in his voice required an answer, even if that answer was untainted by knowledge. One of his minions leaped forward. "That's a minor chord, Mr. Thalberg," he offered. The next day, an inter-office memo arrived in the music department with instructions to post it conspicuously. It read as follows: "From the above date onward, no music in an MGM film is to contain a 'minor chord'." Signed, "IRVING THALBERG." When I left the studio for the last time, twenty-five years after this missive's arrival, it was still on the wall in the music department, under glass and heavily bolted. I must now confess that I actually tried to get the thing off the wall with a heavy-duty screwdriver, but nothing would budge the rusted screws. Previn was quoted in a promotional video I saw last night, praising the excellent Orchestra of St. Luke's. I love chamber orchestras in general--you just don't get that feathery intimacy and crisp footprint from a big fat ensemble--and this one is at the top of the list. The benefit was black tie. Fifteen minutes before it was time to leave, I was groping around for my cuff links and wondering how I would get the cat hair off my tuxedo pants. I gave up, went in mufti, and felt like a 9-year-old sneaking into a circus tent. Wynton Marsalis said a few words. Barbara Feldon said a few words. Yes, that's right, Barbara Feldon, still looking and sounding remarkably like Agent 99 from Get Smart, where her PG-rated sensuality was always at loggerheads with Don Adams's perpetual adolescence. We never grow up. The orchestra played the Marriage of Figaro overture and was joined by mezzo Kate Lindsey for "Voi che sapete" and "Non so più cosa son" and I believe I heard a couple of minor chords in there. Mozart breaks the rules, of course, making his minor triads smile in a pained sort of way when he's so inclined. Still, Irving Thalberg was probably spinning in his grave. Newsweek Poland put the late writer, reckoned to be greatest east European journalist of his generation, on the cover of this week's issue, unveiling details of his communist-era secret police file and claiming that his global travels in the 1960s and 70s were due to a bargain he struck with the communist regime to collaborate with the secret police. Ironically (or not ironically) Kapuscinski's greatest books--The Emperor and Shah of Shahs--were often read as oblique commentaries on contemporary Poland: scathing dissent in the guise of globe-trotting, poker-faced journalism. I love them anyway. Stay tuned for further developments. On April 11, the stage at Lincoln Center's Alice Tully Hall was initially bare, save for an apostolic assortment of 12 chairs, 12 bottles of mineral water, and a dramatic flower arrangement. Behind me, a guy was concluding an intricate business deal on his cell as Tree Swenson, executive director of the Academy of American Poets, came onto the stage to deliver her introductory remarks. The Academy raises money for a host of worthy programs, including National Poetry Month and the Poetry Audio Archive. Yet tonight's event, dubbed "Poetry & The Creative Mind," is arguably the jewel in the organization's fund-raising crown: an annual conclave of celebrities and public figures reading their favorite specimens of American verse. First up was Ethan Hawke. In a pale suit and T-shirt, and with the careless radiance of a film star, he launched directly into Wallace Stevens's "Thirteen Ways of Looking at a Blackbird." I admired him for this: no hushed, self-celebrating preamble. I admired him less when he stopped three or four blackbirds into the poem and announced he had forgotten to explain who the author was. Bad boy! Even badder: he defied the all-American theme of the evening and pulled out Auden's "As I Walked Out One Evening." This he read in increasingly declamatory tones, like a barfly at elocution school, ramping back only for the penultimate stanza: "O stand, stand at the window / As the tears scald and start; / You shall love your crooked neighbor / With your crooked heart." The crowd went nuts. When I knew him at Metro, he was knee-deep in his religious phase. Quo Vadis?, King of Kings, Barabbas, Ben Hur--he did 'em all. As soon as there were actors in sight wearing white robes and sandals, poor Miklós was called. These were tough films to compose, if for no other reason than the fact that they were absolutely crammed with music, wall-to-wall pious tuttis, and it must have been wildly boring for someones of Miklós's standing. Once I saw him come out of a projection room really in despair. "I just don't know what else to write for that scene in which that fella carries the cross up the hill," he complained. This might not have been Bach's problem, but for lesser mortals, it was a genuine challenge. In order to keep himself interested, Miklós did an amazing (and probably unnecessary) amount of research for each of his projects, and so he was a real expert in biblical instruments, plainsong, Gregorian chant, and the like. He was, in other words, a scholar, and an anachronism in Culver City. During Ben Hur, he was beside himself with impotent rage when the director, William Wyler, suggested that "Silent Night, Holy Night" be played during the Nativity scene. On other fronts: I spent some more time on the forbidden grass, listened to Pierre Boulez conducting the first half of Mahler's Third (with the punchy and primeval Chicago brass section), and read Claire Dederer's funny, counterintuitive piece about Rod McKuen. No derision, no cheap laughs at the poet's expense, who in any case made heaps of money and elicited the loopy praise of W.H. Auden himself. (His poems, Auden declared, were "love letters to the world and I am happy that many of them came to me and found me out.") Bravo! Tuckahoe! I zoomed past that very railroad station on Monday afternoon. I studied the sans-serif signage on the platform for the millionth time: the object of many sophisticated puns when I was a teenager. And now I'm back at the house where I grew up, keeping my ailing father company while my mother takes a vacation. 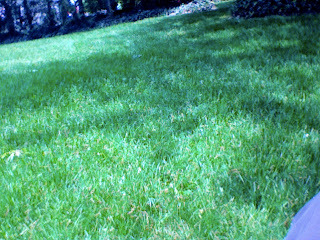 In direct violation of my doctor's orders, I'm sitting out in the yard, surrounded by an L-shaped plot of green, ungroomed, pernicious grass. The phone is ringing inside--an old-fashioned bell rather than some irritating MIDI boogaloo--but I'm not going to answer it. A hedge cutter is going full tilt next door. Small airborne objects keep landing on my hair: seed pods, which resemble helicopter rotors. When you hold them up to the light, you see a tiny network of veins and capillaries, filled with what appears to be blood. It can't be, of course. Still, it brings me back to Whitman's line about the grass, which is too dark "to come from under the faint red roofs of mouths." Can I really be allergic? The breeze has launched another flotilla of seed pods, which do their corkscrew thing before hitting the ground. 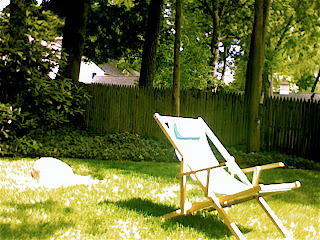 The birds are singing in stereo. I hate to go inside. What does page 99 reveal about its writer? That I think human beings, including myself, are comical. That I'm rather fond of us. That story is a metaphor for what we mean and dream; that my own first loyalty is to the word, which is honor-bound to be neither larger nor lighter, nor noisier nor cleverer, etc., than the idea to which it refers; that my sentences would like to be shapely. Forgive me for mentioning this, but I couldn't resist. "In a weird way, we're part of the establishment now," Miller said, describing Salon's growth since its creation in 1995. "And it sounds harsh, but you get what you pay for. We hired good writers. I used to write for peanuts, and you can't make a living doing that. So it may be that the friction between bloggers and reviewers is just another version of this age-old resentment that aspiring journalists have always felt toward more established journalists." Reviewing is a whole-time job with a half-time salary, a job in which our best work is always submerged in the criticism of someone else's, where all triumphs are ephemeral and only the drudgery is permanent, and where no future is secure except the certainty of turning into a hack. There are days when a reviewer approximates more and more to that robot figure on Brighton pier, who wheedles the passers-by in a brassy subhuman voice, and when they put down a coin hands out a cardboard square of commonplace and irrelevant criticism. He can say of his books like the sundial of the hours, "vulnerant omnes; ultima necat." Who would not rather than the best of reviewers be the worst of novelists and contrive between November and April a novel from the excesses which he has committed from May to October? The tragic accident that happens early in the book ends Johnny's silversmithing: his right thumb is melded to the palm of his hand by molten silver. During recess, I started holding my hand like his in the pocket of my coat, trying to get through the entire period without uncrippling myself. There was a sweetness in the bitterness I felt as I imagined that I was Johnny and the whole world had turned against me, even my fiancée, Cilla, and her real-life corollary, Susan Pusateri. Had Susan smiled? She would marry me in spite of my deformity. Was she talking energetically to Joey Cannarozzi? She preferred his fully opposable thumb, and I would therefore have to lay siege to the British armory. From his description, I can tell that he had the same edition I did ("The cover was a picture of a young Johnny, looking a bit like Twiggie [sic]"). 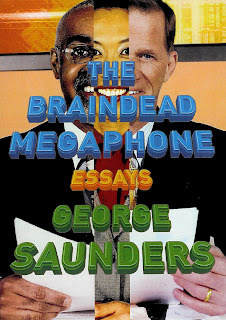 Hats off to you, George S--I'm a bigger fan than ever. I spent another productive hour in the attic on Sunday. My son, up late on Saturday night playing violent video games with his friend, had fallen asleep on the sofa downstairs. My father, nattily dressed for our visit, was half-dozing on the other sofa: still somewhat vertical and determined to stay awake as a matter of pride. So I popped up to the top floor with my mother to rummage around in the memory palace and fill up one of those industrial-size trash bags. The fly strip is gone. Even the flies seem to be gone, replaced by a benign infestation of ladybugs, most of them dead. We swept them out of the way as we piled up the linens, empty boxes, unused photo albums, flannel shoe bags from Allen Edmonds. There is an art to throwing things away. It requires tact, especially in the company of another person. You can laugh at the dotty decision to save this or that bit of trash--but not too much. It's personal. I was heartless when it came to my own things, tossing almost all of them onto the pile. "You're unsentimental," my mother kept telling me. This was a falsehood, as she surely knew. These days it takes very little to move me, as if my own layer of insulation had been stripped away and the air, invisibly flecked with pollen and shards of fiberglass, were blowing directly onto my nervous system. I weep at things, then at the memory of things, then at the memory of remembering them. It's not really weeping: it's an internal pressure, a kind of warmth that creeps upward from the chest and vanishes through the top of one's head. It should be funny but it isn't. In an old jewelry box, covered with fake or possibly real alligator skin, and with a square clock embedded in the lid, I found this medallion. It's mine. I got it in 1967, when we took one of our rare family vacations, driving from Queens to Oak Ridge, Tennessee, where my father was attending a scientific powwow. With my sister and brother I bounced around in the back seat of our Buick Electra 225. We fought over who got to rest his or her elbow on the pull-down elbow rest. At the first motel, in northern Virginia, we were thrilled to discover that the waitress had a faint accent and that grits were on the menu. We spent one afternoon in Gatlinburg, with its wax museums and carny atmosphere. In the souvenir shops my brother and I found baskets of rusting American bayonets, supposedly still discolored with Japanese blood. These my parents refused to buy for us. They did shell out for two slingshots--rustic implements with enormous mischief-making potential. Remarkably, we had broken nothing, killed nothing, by the time the Electra pulled into the motel parking lot. We were, my father told us, in the Smoky Mountains. Our room had a narrow deck in back, overlooking the Little Pigeon River. The room and the deck were separated by a sliding glass door, and within a few minutes of our arrival, I walked into it. "Don't touch me! Don't touch me with that dreadful hand!" Johnny stopped. It was the worst thing that anyone had said to him. He stood like stone, his hand thrust back into his pocket. Cilla froze too--half under the kitchen table, a lime in her hand. "Oh, Isannah, how could you?" The nervous child went on screaming. "Go away, Johnny, go away! I hate your hand." Cilla slapped her and she burst into tears. I had discovered several things: fate, cruelty, fellow feeling. These discoveries were so distracting that I didn't see the glass door, which the proprietors had thoughtfully marked with decals of butterflies and fanciful, Flower-Power-era blossoms. All these years later, hundreds of subsequent books have silted up my brain. Yet Johnny Tremain retains its peculiar power and vividness, which is why I kept urging it on my son when he turned eight, which is why he refused to read it. 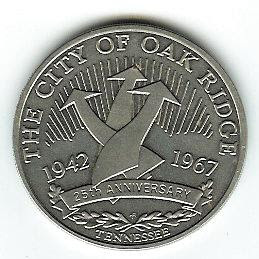 Oak Ridge itself had been summoned out of nothing only 25 years before. It was the so-called Invisible City, built on 60,000 deserted acres as part of the Manhattan Project. The uranium enrichment facilities on the grounds were top secret--as was the very existence of the city, despite the fact that the population soon reached 75,000 and that the installation briefly consumed one-seventh of all the electricity generated in the United States. By the time of our visit, during the Summer of Love, the place had long since come out of the closet. 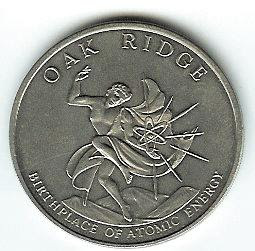 In those palmier, pre-Chernobyl days, nuclear power hadn't yet acquired its bad rep: you could still strike a commemorative medallion with a Promethean man pulling a shiny atom out of his cloak. While my father attended symposia during the day, my mother escorted us through the American Museum of Science and Energy. There we took turns putting our hands in a pair of those hazmat gloves, which allowed you to manipulate nuclear materials through a thick plate of protective glass. In the afternoon we swam in the motel pool--what Jethro Bodine would have called the "cement pond," even though nobody in Tennessee seemed to speak that way. I came away from that trip with three souvenirs: a trio of irradiated glass marbles (immediately lost), the slingshot (ditto), and the medallion. I brought it downstairs to show my father. He examined it in the lamplight, holding it by the edges. "You've really got something here," he told me. "If you wash it off in soap and water, it'll be a collector's item." My father has been sick. He spent some time in the hospital, just down the hall from an honest-to-god gangster, whose door was guarded day and night by a stoic-looking police officer. This imparted some extra drama, I guess, but drama wasn't what we needed--not when my father arrived at the hospital in shock, with a potassium deficiency that made the entire world look slightly yellow to him. Now he's on the mend, at home again, and I've been spending more time than usual with my parents, in the house where I grew up. The place was built in 1925. The exterior was covered in white aluminum siding when I was an adolescent, so it looks reasonably trim, but the interior has continued to age, and the beating heart of the physical plant--the furnace--is antediluvian: it used to be a coal-burning unit, and the two doors in front are cemented shut with some brutal adhesive, which looks like bone marrow. The other day I spent some time up in the attic. Much of the space is occupied by my father's shirts, bundle after bundle of them, wrapped up in brown paper from the Chinese laundry and labeled according to some intricate seasonal taxonomy. There are many, many discarded boxes from space heaters, radios, humidifiers: it looks like the Rapture took place in an appliance store. There are also mementos, stored in every conceivable type of container. Nina and I pried open two old suitcases, with stickers from the U.S.S. United States and luggage tags from Idlewild Airport, which is what they called JFK until 1963. Inside were relics from my childhood. We went through them with my mother, who agreed to throw away some of these treasures but kept quite a few of them for a second culling. One of my favorites: the libretto (I'm afraid that's the word I used) for the rock opera I wrote based on David Copperfield. If you were thirteen years old in 1972, and you had played the two-record set of Tommy until the grooves began to wear out, writing a rock opera was a very natural idea. 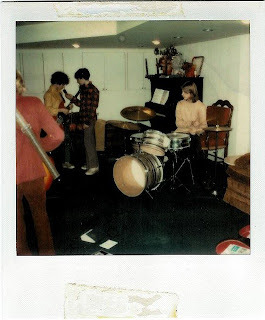 We rehearsed over at my friend Mark's house, in the basement, and he took these Polaroids, which were Scotch-taped into the back of the libretto in order to document the birth pangs of the project. There I am with my red Epiphone guitar and dingy white sneakers, dreaming up some Dickensian lyrics. I had glasses, a surfeit of greasy hair, pimples. Yet at this apex of personal homeliness I was strangely confident. Nothing terrible had ever happened to me. I assumed that I could write a rock opera--knowing even then that some of the songs were merely vehicles for long, idea-starved guitar solos--and that we would perform it in the school auditorium and I would move on to the next chapter in my life as a Renaissance Man. 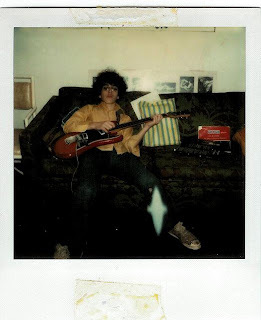 In 1972 a Polaroid camera was still something of a novelty: a small miracle of instant gratification. In fact the original SX-70, with its snappy folding design, was introduced that very year. In some of the photos, the ancient Mylar has begun to pull away from the emulsion. But most of the images are surprisingly crisp, given the crude chemical palette and poor exposure. No doubt their mummified existence in the suitcase gave them an extra shot at longevity. In any case, I've been studying them with embarrassment, curiosity, affection. My youth--represented by a nearly impregnable, steel-belted state of innocence--is gone. The things which I have seen I now can see no more. 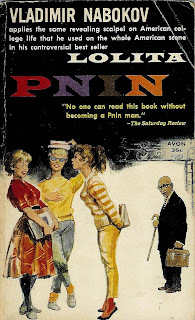 During one melting moment, he had the sensation of holding at last the key he had sought; but, coming from very far, a rustling wind, its soft volume increasing as it ruffled the rhododendrons--now blossomless, blind--confused whatever rational pattern Timofey Pnin's surroundings had once had. He was alive and that was sufficient. ...from the window one could clearly see the lake with its cloud and castle, in a motionless and perfect correlation of happiness. Without reasoning, without considering, only entirely surrendering to an attraction the truth of which consisted in its own strength, a strength which he had never experienced before, Vasili Ivanovich in one radiant second realized that here in this little room with that view, beautiful to the verge of tears, life would at last be what he had always wished it to be. For his troubles he is beaten and tortured by his German fellows. (A brutal touch: "It occurred to them, among other things, to use a corkscrew on his palms; then on his feet.") This was one of Nabokov's great favorites, and the first of his stories he translated into English upon his arrival in America. For a long time I couldn't understand why. The concluding ugliness seemed to outweigh the ecstasy of Vasili Ivanovich's perfect moment. But I was wrong: the ecstasy is there in almost every sentence, rising and falling with a sort of Doppler effect. It happened that on a distant slope or in a gap in the trees there would appear and, as it were, stop for an instant, like air retained in the lungs, a spot so enchanting--a lawn, a terrace--such perfect expression of tender well-meaning beauty--that it seemed that if one could stop the train and go thither, forever, to you, my love.... But a thousand beech trunks were already madly leaping by, whirling in a sizzling sun pool, and again the chance for happiness was gone. Books take us toward life and away from it. They immerse us in experience and make experience bearable by distracting us from it. So I lay on the new bed with its firm mattress until late at night, feeling my antediluvian heart racing and worrying about that terrible thing, the death of a parent. Nothing quite that terrible--nothing quite that permanent--has happened to me yet. A few more years of innocence would be fine. "By nature," Lore Segal told an interviewer in 1985, "I am infinitely slow." At the time, she was accounting for the two decades (give or take a year) it took her to write Her First American." Well, another two decades have passed. And Ilka Weissnix, the Viennese refugee whose prolonged and painful transplantation to the New World was the subject of that earlier novel, has returned. By the time we encounter her in Shakespeare's Kitchen--a collection of stories so effectively soldered together that we may as well call it a novel--Ilka has exiled herself once again, this time to suburban Connecticut. This is something of a puzzle. Having gotten a toehold in New York City ("naturalized," as the Viennese-born Segal once wrote of herself, "not in North America so much as in Manhattan"), why would she ever leave?